For every medical ultrasound transducer it's important to characterize the field it creates, whether for safety of imaging or efficacy of therapy. We are able to measure a 2D acoustic pressure distribution in the beam emanating from the source transducer and then reconstruct mathematically the exact field on the surface of the transducer and in the entire 3D space. The present technology relates generally to portable acoustic holography systems for therapeutic ultrasound sources, and associated devices and methods. In some embodiments, a method of characterizing an ultrasound source by acoustic holography includes the use of a transducer geometry characteristic, a transducer operation characteristic, and a holography system measurement characteristic. A control computer can be instructed to determine holography measurement parameters. Based on the holography measurement parameters, the method can include scanning a target surface to obtain a hologram. Waveform measurements at a plurality of points on the target surface can be captured. Finally, the method can include processing the measurements to reconstruct at least one characteristic of the ultrasound source. Methods of derating a nonlinear ultrasound field and associated systems are disclosed herein. A method of derating a nonlinear ultrasound field in accordance with an embodiment of the present technology can include, for example, calibrating an ultrasound source to a first source voltage (Vw) and generating a nonlinear acoustic wave from the ultrasound source into water. The method can further include measuring a focal waveform of the nonlinear acoustic wave and determining a second source voltage (Vt) of the ultrasound source that generates the same focal waveform in tissue. Karzova, M.M., P.V. Yuldashev, O.A. Sapozhnikov, V.A. Khokhlova, B.W. Cunitz, W. Kreider, and M.R. Bailey, "Shock formation and nonlinear saturation effects in the ultrasound field of a diagnostic curvilinear probe," J. Acoust. Soc. Am., 141, 2327-2337, doi:10.1121/1.4979261, 2017. Newer imaging and therapeutic ultrasound technologies may benefit from in situ pressure levels higher than conventional diagnostic ultrasound. One example is the recently developed use of ultrasonic radiation force to move kidney stones and residual fragments out of the urinary collecting system. A commercial diagnostic 2.3 MHz C5-2 array probe has been used to deliver the acoustic pushing pulses. The probe is a curvilinear array comprising 128 elements equally spaced along a convex cylindrical surface. The effectiveness of the treatment can be increased by using higher transducer output to provide a stronger pushing force; however nonlinear acoustic saturation can be a limiting factor. In this work nonlinear propagation effects were analyzed for the C5-2 transducer using a combined measurement and modeling approach. Simulations were based on the three-dimensional Westervelt equation with the boundary condition set to match low power measurements of the acoustic pressure field. Nonlinear focal waveforms simulated for different numbers of operating elements of the array at several output power levels were compared to fiber-optic hydrophone measurements and were found to be in good agreement. It was shown that saturation effects do limit the acoustic pressure in the focal region of a diagnostic imaging probe. Rosnitskiy, P.B., P.V. Yuldashev, O.A. Sapozhnikov, A.D. Maxwell, W. Greider, M.R. Bailey, and V.A. Khokhlova, "Design of HIFU transducers for generating specified nonlinear ultrasound fields," IEEE Trans. Ultrason., Ferroelect., Freq. Control, 64, 374-390, doi:10.1109/TUFFC.2016.2619913, 2017. Various clinical applications of high-intensity focused ultrasound have different requirements for the pressure levels and degree of nonlinear waveform distortion at the focus. The goal of this paper is to determine transducer design parameters that produce either a specified shock amplitude in the focal waveform or specified peak pressures while still maintaining quasi-linear conditions at the focus. Multiparametric nonlinear modeling based on the Khokhlov-Zabolotskaya-Kuznetsov (KZK) equation with an equivalent source boundary condition was employed. Peak pressures, shock amplitudes at the focus, and corresponding source outputs were determined for different transducer geometries and levels of nonlinear distortion. The results are presented in terms of the parameters of an equivalent single-element spherically shaped transducer. The accuracy of the method and its applicability to cases of strongly focused transducers were validated by comparing the KZK modeling data with measurements and nonlinear full diffraction simulations for a single-element source and arrays with 7 and 256 elements. The results provide look-up data for evaluating nonlinear distortions at the focus of existing therapeutic systems as well as for guiding the design of new transducers that generate specified nonlinear fields. Hunter, C., O.A Sapozhnikov, A.D. Maxwell, V.A. Khokhlova, Y.-N. Wang, B. MacConaghy, and W. Kreider, "An ultrasonic caliper device for measuring acoustic nonlinearity," Phys. Procedia, 87, 93-98, doi:10.1016/j.phpro.2016.12.015, 2016. In medical and industrial ultrasound, it is often necessary to measure the acoustic properties of a material. A specific medical application requires measurements of sound speed, attenuation, and nonlinearity to characterize livers being evaluated for transplantation. For this application, a transmission-mode caliper device is proposed in which both transmit and receive transducers are directly coupled to a test sample, the propagation distance is measured with an indicator gage, and receive waveforms are recorded for analysis. In this configuration, accurate measurements of nonlinearity present particular challenges: diffraction effects can be considerable while nonlinear distortions over short distances typically remain small. To enable simple estimates of the nonlinearity coeffcient from a quasi-linear approximation to the lossless Burgers’ equation, the calipers utilize a large transmitter and plane waves are measured at distances of 1550 mm. Waves at 667 kHz and pressures between 0.1 and 1 MPa were generated and measured in water at different distances; the nonlinearity coeffcient of water was estimated from these measurements with a variability of approximately 10%. Ongoing efforts seek to test caliper performance in other media and improve accuracy via additional transducer calibrations. Rosnitskiy, P.B., P.V. Yuldashev, B.A. Vysrokanov, and V.A. Khokhlova, "Setting boundary conditions to the KhokhlovZabolotskaya equation for modeling ultrasound fields generated by strongly focused transducers," Acoust. Phys.,62, 151–159, doi:10.1134/S1063771016020123, 2016. An equivalent source model is developed for setting boundary conditions on the parabolic diffraction equation in order to simulate ultrasound fields radiated by strongly focused medical transducers. The equivalent source is defined in a plane; corresponding boundary conditions for pressure amplitude, aperture, and focal distance are chosen so that the axial solution to the parabolic model in the focal region of the beam matches the solution to the full diffraction model (Rayleigh integral) for a spherically curved uniformly vibrating source. It is shown that the proposed approach to transferring the boundary condition from a spherical surface to a plane makes it possible to match the solutions over an interval of several diffraction maxima around the focus even for focused sources with F-numbers less than unity. This method can be used to accurately simulate nonlinear effects in the fields of strongly focused therapeutic transducers using the parabolic KhokhlovZabolotskaya equation. Sapozhnikov, O.A., S.A. Tsysar, V.A. Khokhlova, and W. Kreider, "Acoustic holography as a metrological tool for characterizing medical ultrasound sources and fields," J. Acoust. Soc. Am., 138, 1515-1532, doi:10.1121/1.4928396, 2015. 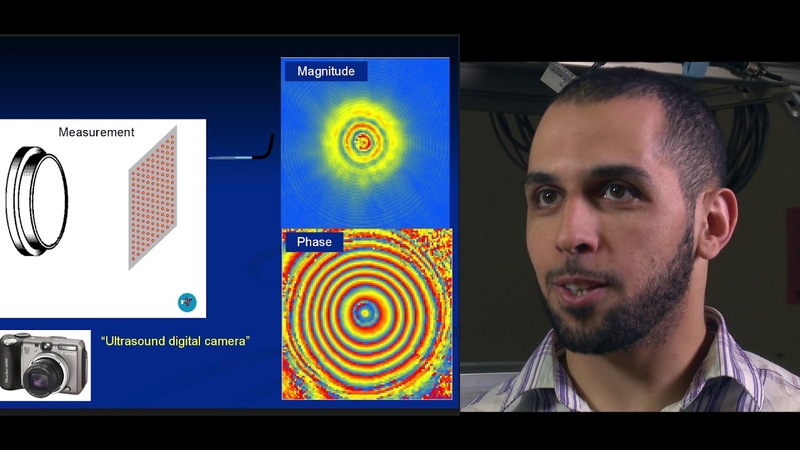 Acoustic holography is a powerful technique for characterizing ultrasound sources and the fields they radiate, with the ability to quantify source vibrations and reduce the number of required measurements. These capabilities are increasingly appealing for meeting measurement standards in medical ultrasound; however, associated uncertainties have not been investigated systematically. Here errors associated with holographic representations of a linear, continuous-wave ultrasound field are studied. To facilitate the analysis, error metrics are defined explicitly, and a detailed description of a holography formulation based on the Rayleigh integral is provided. Errors are evaluated both for simulations of a typical therapeutic ultrasound source and for physical experiments with three different ultrasound sources. Simulated experiments explore sampling errors introduced by the use of a finite number of measurements, geometric uncertainties in the actual positions of acquired measurements, and uncertainties in the properties of the propagation medium. Results demonstrate the theoretical feasibility of keeping errors less than about 1%. Typical errors in physical experiments were somewhat larger, on the order of a few percent; comparison with simulations provides specific guidelines for improving the experimental implementation to reduce these errors. Overall, results suggest that holography can be implemented successfully as a metrological tool with small, quantifiable errors. Rosnitskiy, P.B., P.V. Yuldashev, and V.A. Khokhlova, "Effect of the angular aperture of medical ultrasound transducers on the parameters of nonlinear ultrasound field with shocks at the focus," Acoust. Phys., 61, 301-307, doi:10.1134/S1063771015030148, 2015. Certain modern applications of high-intensity focused ultrasound (HIFU) in medicine use the nonlinear effect of shock front formation in the focal waveform. However, an important problem remains unsolved: determination of transducer parameters that provide the given pressure levels of the shock wave field at the focus required for a specific application. In this paper, simulations based on the KhokhlovZabolotskaya equation are performed to test and confirm the hypothesis that angular aperture of the transducer is the main parameter that determines the characteristic amplitude of the shock front and corresponding values for the peak positive and negative pressures at the focus. A criterion for formation of a developed shock in the acoustic waveform, as well as a method for determining its amplitude is proposed. Quantitative dependences of the amplitude of the developed shock and the peak pressures in the wave profile on the angular aperture of the transducer are calculated. The effects of saturation and the range of changes of the shock waveform parameters at the focus are analyzed for a typical HIFU transducer. Perez, C., H. Chen, T.J. Matula, M. Karzova, and V.A. Khokhlova, "Acoustic field characterization of the Duolith: Measurements and modeling of a clinical shock wave therapy device," J. Acoust. Soc. Am., 134, 1663-1674, doi:10.1121/1.4812885, 2013. Extracorporeal shock wave therapy (ESWT) uses acoustic pulses to treat certain musculoskeletal disorders. In this paper the acoustic field of a clinical portable ESWT device (Duolith SD1) was characterized. Field mapping was performed in water for two different standoffs of the electromagnetic head (15 or 30 mm) using a fiber optic probe hydrophone. Peak positive pressures at the focus ranged from 2 to 45 MPa, while peak negative pressures ranged from 2 to 11 MPa. Pulse rise times ranged from 8 to 500 ns; shock formation did not occur for any machine settings. The maximum standard deviation in peak pressure at the focus was 1.2%, indicating that the Duolith SD1 generates stable pulses. The results compare qualitatively, but not quantitatively with manufacturer specifications. Simulations were carried out for the short standoff by matching a Khokhlov-Zabolotskaya-Kuznetzov equation to the measured field at a plane near the source, and then propagating the wave outward. The results of modeling agree well with experimental data. The model was used to analyze the spatial structure of the peak pressures. Predictions from the model suggest that a true shock wave could be obtained in water if the initial pressure output of the device were doubled. Kreider, W., P. Yuldashev, O.A. Sapozhnikov, N. Farr, A. Partanen, M. Bailey, and V.A. Khokhlova, "Characterization of a multi-element clinical HIFU system using acoustic halography and nonlinear modeling," IEEE Trans. Ultrason. Ferr. Freq. Control, 60, 1683-1698, doi:10.1109/TUFFC.2013.2750, 2013. High-intensity focused ultrasound (HIFU) is a treatment modality that relies on the delivery of acoustic energy to remote tissue sites to induce thermal and/or mechanical tissue ablation. To ensure the safety and efficacy of this medical technology, standard approaches are needed for accurately characterizing the acoustic pressures generated by clinical ultrasound sources under operating conditions. Characterization of HIFU fields is complicated by nonlinear wave propagation and the complexity of phased-array transducers. Previous work has described aspects of an approach that combines measurements and modeling, and here we demonstrate this approach for a clinical phased-array transducer. First, low amplitude hydrophone measurements were performed in water over a scan plane between the array and the focus. Second, these measurements were used to holographically reconstruct the surface vibrations of the transducer and to set a boundary condition for a 3-D acoustic propagation model. Finally, nonlinear simulations of the acoustic field were carried out over a range of source power levels. Simulation results were compared with pressure waveforms measured directly by hydrophone at both low and high power levels, demonstrating that details of the acoustic field, including shock formation, are quantitatively predicted. Yuldashev, P.V., S.M Shmeleva, S.A. Ilyin, O.A. Sapozhnikov, L.R. Gavrilov, and V.A. Khokhlova, "The role of acoustic nonlinearity in tissue heating behind a rib cage using a high-intensity focused ultrasound phased array," Phys. Med. Biol., 58, 2537, 2013. The goal of this study was to investigate theoretically the effects of nonlinear propagation in a high-intensity focused ultrasound (HIFU) field produced by a therapeutic phased array and the resultant heating of tissue behind a rib cage. Three configurations of focusing were simulated: in water, in water with ribs in the beam path and in water with ribs backed by a layer of soft tissue. The Westervelt equation was used to model the nonlinear HIFU field, and a 1 MHz phased array consisting of 254 circular elements was used as a boundary condition to the model. The temperature rise in tissue was modelled using the bioheat equation, and thermally necrosed volumes were calculated using the thermal dose formulation. The shapes of lesions predicted by the modelling were compared with those previously obtained in in vitro experiments at low-power sonications. Intensity levels at the face of the array elements that corresponded to the formation of high-amplitude shock fronts in the focal region were determined as 10 W cm-2 in the free field in water and 40 W cm-2 in the presence of ribs. It was shown that exposures with shocks provided a substantial increase in tissue heating, and its better spatial localization in the main focal region only. The relative effects of overheating ribs and splitting of the focus due to the periodic structure of the ribs were therefore reduced. These results suggest that utilizing nonlinear propagation and shock formation effects can be beneficial for inducing confined HIFU lesions when irradiating through obstructions such as ribs. Design of compact therapeutic arrays to provide maximum power outputs with lower intensity levels at the elements is necessary to achieve shock wave regimes for clinically relevant sonication depths in tissue. Simulation of three-dimensional nonlinear fields of ultrasound therapeutic arrays. Yuldashev, P.V., and V.A. Khokhlova, "Simulation of three-dimensional nonlinear fields of ultrasound therapeutic arrays." Acoust. Phys., 57, 334-343, doi:10.1134/S1063771011030213, 2011. A novel numerical model was developed to simulate three-dimensional nonlinear fields generated by high intensity focused ultrasound (HIFU) arrays. The model is based on the solution to the Westervelt equation; the developed algorithm makes it possible to model nonlinear pressure fields of periodic waves in the presence of shock fronts localized near the focus. The role of nonlinear effects in a focused beam of a two-dimensional array was investigated in a numerical experiment in water. The array consisting of 256 elements and intensity range on the array elements of up to 10 W/cm2 was considered. The results of simulations have shown that for characteristic intensity outputs of modern HIFU arrays, nonlinear effects play an important role and shock fronts develop in the pressure waveforms at the focus. Bobkova, S., L. Gavrilov, V. Khokhlova, A. Shaw, and J. Hand, "Focusing of high intensity ultrasound through the rib cage using a therapeutic random phased array," Ultrasound Med. Biol., 36, 888-906, doi:10.1016/j.ultrasmedbio.2010.03.007, 2010. A method for focusing high-intensity ultrasound (HIFU) through a rib cage that aims to minimize heating of the ribs while maintaining high intensities at the focus (or foci) was proposed and tested theoretically and experimentally. Two approaches, one based on geometric acoustics and the other accounting for diffraction effects associated with propagation through the rib cage, were investigated theoretically for idealized source conditions. It is shown that for an idealized radiator, the diffraction approach provides a 23% gain in peak intensity and results in significantly less power losses on the ribs (1% vs. 7.5% of the irradiated power) compared with the geometric one. A 2-D 1-MHz phased array with 254 randomly distributed elements, tissue-mimicking phantoms and samples of porcine rib cages are used in experiments; the geometric approach is used to configure how the array is driven. Intensity distributions are measured in the plane of the ribs and in the focal plane using an infrared camera. Theoretical and experimental results show that it is possible to provide adequate focusing through the ribs without overheating them for a single focus and several foci, including steering at plus/minus 1015 mm off and plus/minus 20 mm along the array axis. Focus splitting caused by the periodic spatial structure of ribs is demonstrated both in simulations and experiments; the parameters of splitting are quantified. The ability to produce thermal lesions with a split focal pattern in ex vivo porcine tissue placed beyond the rib phantom is also demonstrated. The results suggest that the method is potentially useful for clinical applications of HIFU, for which the rib cage lies between the transducer(s) and the targeted tissue. Bessonova, O.V., V.A. Khokhlova, M.S. Canney, M.R. Bailey, and L.A. Crum, "A derating method for therapeutic applications of high intensity focused ultrasound," Acoust. Phys., 56, 354-363, 2010. Current methods of determining high intensity focused ultrasound (HIFU) fields in tissue rely on extrapolation of measurements in water assuming linear wave propagation both in water and in tissue. Neglecting nonlinear propagation effects in the derating process can result in significant errors. In this work, a new method based on scaling the source amplitude is introduced to estimate focal parameters of nonlinear HIFU fields in tissue. Focal values of acoustic field parameters in absorptive tissue are obtained from a numerical solution to a KZK-type equation and are compared to those simulated for propagation in water. Focal waveforms, peak pressures, and intensities are calculated over a wide range of source outputs and linear focusing gains. Our modeling indicates, that for the high gain sources which are typically used in therapeutic medical applications, the focal field parameters derated with our method agree well with numerical simulation in tissue. The feasibility of the derating method is demonstrated experimentally in excised bovine liver tissue. Bessonova, O.V., V.A. Khokhlova, M.S. Canney, M.R. Bailey, and L.A. Crum, "Nonlinear derating method for high intensity focused ultrasound (HIFU) fields," In Proceedings, IEEE International Ultrasonics Symposium, Rome, Italy, 20-23 September, 216-219, doi:10.1109/ULTSYM.2009.5441494 (IEEE, 2009). In this work, a new derating method to extrapolate nonlinear ultrasound fields in water to biological tissue is proposed and tested for therapeutic medical systems. Focal values of acoustic field parameters in absorptive tissue are obtained from a numerical solution to a KZK-type equation and are compared to those derated, using the proposed method, from the results of simulations in water. It is validated in modeling that for high gain sources, which are typically used for therapeutic medical applications, the focal field parameters in tissue can be obtained from the results obtained in water. The feasibility of the derating method is also demonstrated experimentally in water and excised bovine liver tissue using a 2 MHz HIFU source of 44 mm aperture and focal length. Bessonova, O.V., V.A. Khokhlova, M.R. Bailey, M.S. Canney, and L.A. Crum, "Focusing of high intensity ultrasound beams and ultimate values of shock wave parameters," Acoust. Phys., 55, 463-473, 2009. Canney, M.S., M.R. Bailey, L.A. Crum, V.A. Khokhlova, and O.A. Sapozhnikov, "Acoustic characterization of high intensity focused ultrasound fields: A combined measurement and modeling approach," J. Acoust. Soc. Am., 124, 2406-2420, doi:10.1121/1.2967836, 2008. Acoustic characterization of high intensity focused ultrasound (HIFU) fields is important both for the accurate prediction of ultrasound induced bioeffects in tissues and for the development of regulatory standards for clinical HIFU devices. In this paper, a method to determine HIFU field parameters at and around the focus is proposed. Nonlinear pressure waveforms were measured and modeled in water and in a tissue-mimicking gel phantom for a 2 MHz transducer with an aperture and focal length of 4.4 cm. Measurements were performed with a fiber optic probe hydrophone at intensity levels up to 24000 W/cm2. The inputs to a KhokhlovZabolotskayaKuznetsov-type numerical model were determined based on experimental low amplitude beam plots. Strongly asymmetric waveforms with peak positive pressures up to 80 MPa and peak negative pressures up to 15 MPa were obtained both numerically and experimentally. Numerical simulations and experimental measurements agreed well; however, when steep shocks were present in the waveform at focal intensity levels higher than 6000 W/cm2, lower values of the peak positive pressure were observed in the measured waveforms. This underrepresentation was attributed mainly to the limited hydrophone bandwidth of 100 MHz. It is shown that a combination of measurements and modeling is necessary to enable accurate characterization of HIFU fields. Sapozhnikov, O.A., V.A. Khokhlova, and D. Cathignol, "Nonlinear waveform distortion and shock formation in the near field of a continuous wave piston source," J. Acoust. Soc. Am., 115, 1982-1987, doi:, 2004. A classical effect of nonlinear acoustics is that a plane sinusoidal acoustic wave propagating in a nonlinear medium transforms to a sawtooth wave with one shock per cycle. However, the waveform evolution can be quite different in the near field of a plane source due to diffraction. Previous numerical simulations of nonlinear acoustic waves in the near field of a circular piston source predict the development of two shocks per wave cycle [Khokhlova et al., J. Acoust. Soc. Am. 110, 95-108 (2001)]. Moreover, at some locations the peak pressure may be up to 4 times the source amplitude. The motivation of this work was to experimentally verify and further explain the phenomena of the nonlinear waveform distortion. Measurements were conducted in water with a 47-mm-diameter unfocused transducer, working at 1-MHz frequency. For pressure amplitudes higher than 0.5 MPa, two shocks per cycle were observed in the waveform beyond the last minimum of the fundamental harmonic amplitude. With the increase of the observation distance, these two shocks collided and formed one shock (per cycle), i.e., the waveform developed into the classical sawtooth wave. The experimental results were in a very good agreement with the modeling based on the KhokhlovZabolotskayaKuznetsov (KZK) equation. Khokhlova, V.A., R. Souchon, J. Tavakkoli, O.A. Sapozhnikov, and D. Cathignol, "Numerical modeling of finite-amplitude sound beams: Shock formation in the near field of a CW plane piston source," J. Acoust. Soc. Am., 110, 95, doi:10.1121/1.1369097, 2001. Two theoretical models and the corresponding numerical codes for the description of nonlinear acoustic beams radiated from intense cw sources in water are presented. In the first model, diffraction effects are included using the Rayleigh integral, whereas nonlinearity and thermoviscous absorption are accounted for in a quasi-plane approximation. The simulations are performed in the time domain using the code previously developed for single-pulse propagation in medium having arbitrary frequency-dependent absorption. The second model is based on the KhokhlovZabolotskayaKuznetsov equation, which, contrary to the first model, accounts for diffraction in the parabolic approximation. The simulations are performed in the frequency domain using a novel algorithm that has been developed. A variable number of harmonics, which follows the nonlinear broadening of the wave spectrum are employed in the algorithm to speed up calculations. In order to prove the validity and the accuracy of the two codes developed, the simulation of diffraction and nonlinear effects in the near field of an intense ultrasound circular piston source in water is performed. The results of modeling obtained by both codes are compared with each other and with known experimental data, and are found to be in a good agreement. Frequency-domain code is then used for detailed study of the strongly nonlinear regime of propagation, when shocks are developed in the waveform close to the source. It is demonstrated that diffraction plays a major role in shock formation. Development of two shocks in each cycle and their further collision is predicted. It is also shown that nonlinear propagation and shock formation result at some distance in the two times excess of peak positive pressure in comparison with the maximum value obtained in the case of linear propagation. The beam total power decay due to formation of shocks as a function of the propagation distance is compared with the intensity in a plane wave propagation without diffraction. It is shown that nonlinear energy decay starts earlier for the beam, but decreases slower over longer distances.